Stay cheery and bright this spring with DIY home decor! 1. First, Cut a pennant shape out of the Luxe White Card stock. This is easy to do by trimming the bottom corners of your 8.5 x 11 paper. Then use a hole punch to create an opening for your ribbon in each upper corner. Set aside. 2. 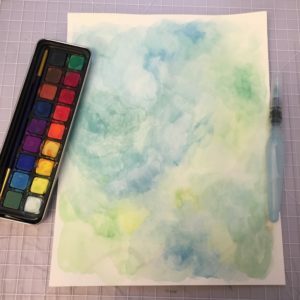 Next, start by using your watercolors and aqua brush, paint one sheet of paper in the colors of your leaves and let dry. 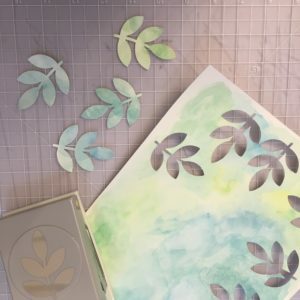 In addition to leaves, repeat using the color way of you choice for flowers. Set aside to let dry. 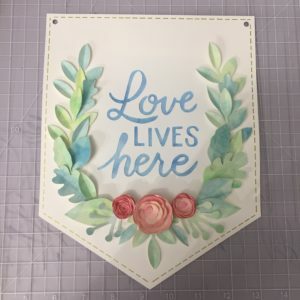 Then, once your watercolor pieces dry, use the leaf punch and flower punch to cut out enough pieces to decorate your pennant. 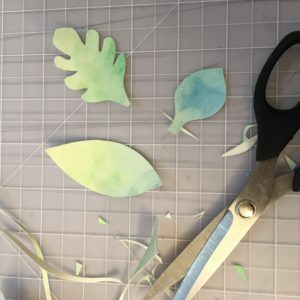 Similarly, you can also hand cut shapes to create different types of botanical leaves or flowers. Use a bone folder to curl the ends of the leaves or flower petals for extra dimension. Layer several flower pieces together to create blooming flowers. 3. Next, use a pen, marker or paint brush to create a hand-lettered message on the center of your pennant. If desired, add a boarder to your pennant with a pen. After that, arrange your leaves and flowers on your pennant surrounding your message. Finally, adhere with glue and foam squares. Foam square help layer your pieces and add dimension. 4. To finish, cut a ribbon to your desired length and thread through the holes at the top. 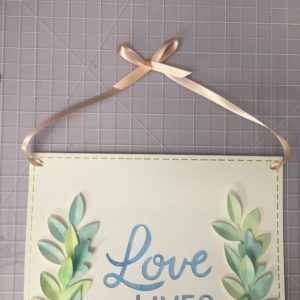 Now, you are ready to proudly hang you newest DIY home decor creation! 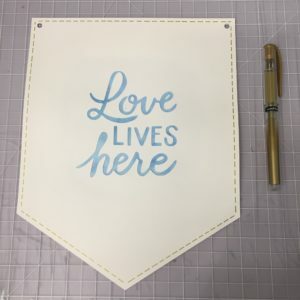 Similarly, this pennant can be used for many occasions including baby showers, weddings and more. 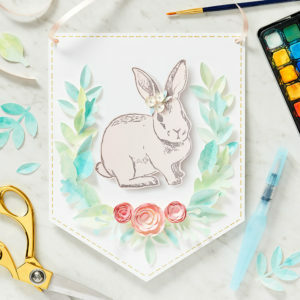 Just mix it up by adding your own message or critter like we did with this spring time bunny!